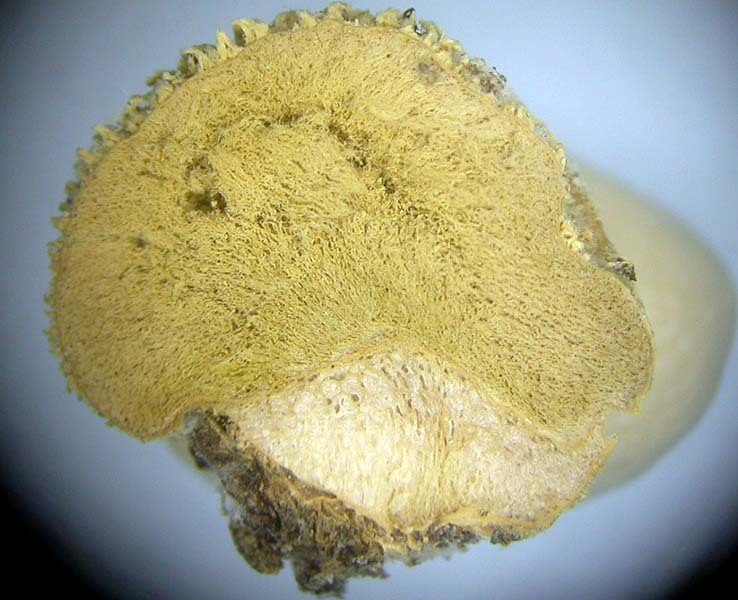 Fruiting body 1-2 cm broad, frequently clustered, globose to subglobose, sessile, occasionally with a rudimentary base attached by sparse mycelium to the substrate; exoperidium white, of cylindrical curved spines joined at the tips, interspersed with powdery, furfuraceous granules, these more common towards the base; in age spines falling away in small groups, not sheets or plates, from the apex, leaving furfuraceous granules over a light-brown endoperidium; subgleba reduced to the immediate basal region, composed of brownish to purple-tinged cells separated from the the gleba by a thin diaphragm, the latter umbonate to broadly-conic in profile; gleba white, then olivaceous, eventually light-brown; spores dehiscing via a small, ragged apical opening; odor and taste untried. Spores globose to subglobose 2.5-3.5 µm, smooth to asperulate with a central oil droplet, and nub-like pedicel; paracapillitium abundant throughout the gleba, thin-walled, hyaline, septate, non poroid; true capillitium sparse, restricted to the periphery of the gleba, i.e. adjacent to the endoperidium, moderately thick-walled, non-septate, lacking pores; spores olive-brown in deposit. Clustered to gregarious in grassy areas and disturbed ground; fruiting after fall rains; known only from lowland regions of California; rarely collected but possibly more common than records indicate. Presumably edible when young with a white gleba; too small to have much culinary value. 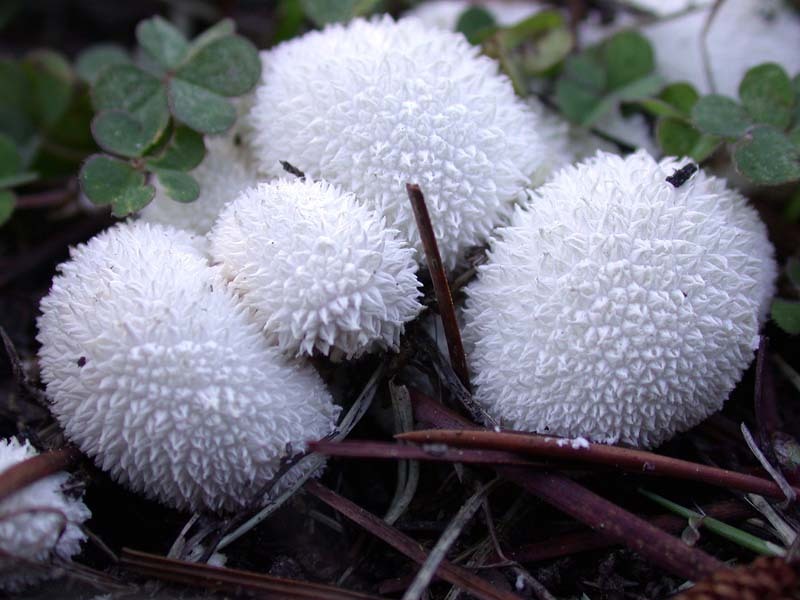 A small puffball of grassy areas, Lycoperdon curtisii is recognized by a clustered fruiting habit and exoperidium of spines arranged in groups with fused tips. Microscopically, a helpful although not definitive character, is a gleba composed almost entirely of paracapillitium and relatively small, nearly smooth spores. Lycoperdon curtisii can be confused with a number of small puffballs. Bovista species such as B. plumbea, B. aestivalis, and B. dermoxantha are similar in size and shape but lack conspicuous grouped spines. Lycoperdon (Vascellum) pratense, when small, resembles L. curtisii, but the exoperidium is covered with a mixture of relatively scattered thin, recurved spines and fufuraceous granules which become ochre-colored in age. In addition, Vascellum pratense has a well developed subgleba separated frm the gleba by a flat to concave, not convex-umbonate diaphragm. Lycoperdon marginatum is also similar when young with an exoperdium of fused pointed spines and warts, but these fall away in large plates rather than singly or in small groups. Additionally the subgleba and gleba are not separated by a diaphragm, and the gleba is dominated by true capillitium. Most easily distinguished is a small montane puffball, Calvatia subcretacea. It possesses an exoperidium of pointed warts, but the tips are greyish to light-brown, and a subgleba is absent.